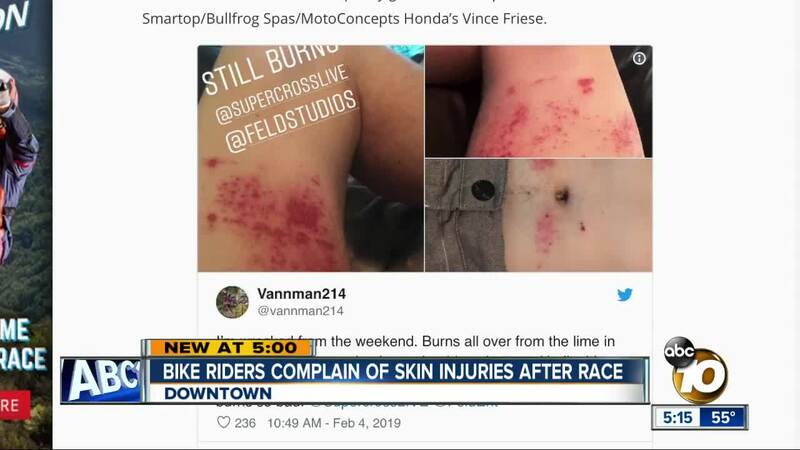 SAN DIEGO (KGTV) -- A drying agent reportedly burned riders and caused severe damage to bikes at the San Diego Supercross event in Petco Park. According to Motocross Action Magazine , crews used lime to try to dry out the track as rain drenched San Diego. The magazine reports that there was too much water on the track, causing the bikes and riders to become covered in mud. As a result, the lime in the mud reportedly burned riders and caused serious damage to bikes. The entertainment company says lime has been used safely for decades at Supercross to dry dirt and reduce the risk of accidents for riders. Lime is also used in construction, according to lime.org . "Because quicklime can cause burns, and hydrated lime can irritate skin and eyes, precautions should be taken when handling these products," the website goes on to say.